Over the past few weeks, I have written to share our plan for school leadership with a specific focus on the status of our comprehensive search for an Interim Head of School. Today, I am pleased to announce Dr. Leonard D. Fitts as our Interim Head of School effective Wednesday, January 30, 2019. His selection by the Board of Trustees follows an extensive process that surfaced potential candidates through a professional firm as well as members of our community. The most qualified applicants were chosen for interviews with a panel consisting of myself, an educator from Bishop Eustace, a representative from our parents’ association, and alumni from our community. This multiplicity of input sources was critical to the Board as it worked to make the best decision regarding school leadership. Such broad consultation was important to us as the progressive philosophy of Saint Vincent Pallotti values the power of laity in leadership. Dr. Fitts joins the Bishop Eustace family as part of an impressive career in educational leadership at the secondary and collegiate levels. Most recently, he served as the Interim Superintendent of schools for the Pleasantville School District. That post is one of several interim superintendent positions he has held in New Jersey and Pennsylvania over the course of the past 20 years. Dr. Fitts earned a Doctorate in Educational Psychology and Administration from the University of Pennsylvania and an MBA in Finance and Administration from Drexel University in addition to being a licensed clinical psychologist. He also holds certifications to serve as a school psychologist, supervisor, principal, administrator, and superintendent among other roles. His passion for educational leadership and strong business background, make Dr. Fitts the ideal choice for interim Head of School. We have every confidence that his proven record as a leader, collaborator, team builder, and mentor will help us to achieve the results we seek in order to strengthen and sustain Bishop Eustace. In addition to his professional expertise, Dr. Fitts has been active in a number of commissions, philanthropic organizations, and boards demonstrating his strong desire to contribute to the welfare of the community-at-large. To provide you with a better understanding of his work, here is a brief biography. In his role as Interim Head of School, Dr. Fitts will report to the Board of Trustees and to me in my role as Chairman. I previously shared a copy of the job description utilized during our search process. Here it is once again to provide a sense of the duties Dr. Fitts will undertake in service to the Bishop Eustace family. I know many of you are eager to meet our new Interim Head of School. Dr. Fitts will be introduced to the administration, faculty, staff, and students at school this week. Dedicated opportunities will be made available for our parents and alumni to meet him in the coming days. Our plan is to schedule time for such engagements at school during the evening and I will share information with you as soon as possible. The recent process was a demanding one for all members of our community. 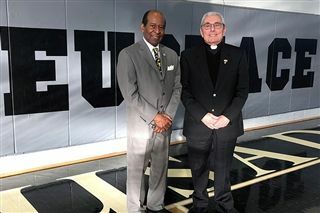 I remain grateful for your passion and dedication to Bishop Eustace as well as your patience as we worked to determine the best possible candidate to lead in the interim capacity. Please join me in extending congratulations and prayerful best wishes to Dr. Fitts as he prepares to assume his duties. I look forward to working with him in support of our mission. As we move forward, know of my prayers for you and your families and of my deep commitment to every member of the Bishop Eustace Preparatory School community. Very Reverend Peter T. Sticco, S.A.C.